MSNBC Issues a Challenge. We Accept! Phil Griffin: ‘Show me an example of us fund-raising.’ Challenge accepted. With MSNBC Video! KASICH: So it is a very central race. And, 11 times, Sean, they're coming after Johnny Kasich for 11 times he's going to be here. It's amazing. KASICH: People can come on our website at KasichforOhio.com. Sunday night at 6:30. We're going to talk about the damage the Obama agenda has done to us. And if you have extra nickels or dimes please send it our way. HANNITY: I want to put this -- put some emphasis on this because this is really important. Explain to people why -- we cannot afford to lose that race? Phil Griffin, the president of MSNBC, and others strenuously object to the idea that Fox and MSNBC are opposite sides of the same coin. “Show me an example of us fund-raising,” he said in a recent interview. A gauntlet thrown, eh Mr Griffin? Very well, we accept. GRAYSON: That‘s why 50,000 people have come to the website, congressmanwithguts.com and made a contribution to our campaign. DORF: We‘re also gathering our own army of volunteers to help out, to man polls, to make sure that every voter has a chance to cast their ballot. It‘s AlexiForIllinois.com. We can use volunteers. We want people to come in and help really bring some integrity into Illinois with Alexi Giannoulias. GRAYSON: 20 percent of all of the money that‘s been spent by these outside right-wing forces in the entire country has been spent against me.... But luckily for us, we‘ve had people come to our Web site, congressmanwithguts.com. Over 80,000 contributions so far -- 80,000 people have contributed to our campaign. SCHULTZ: Adam Green, you‘re doing what you have to do. Thanks for doing it, and congratulations. Great work. Keep going. SCHULTZ: Is he outspending you by what number? 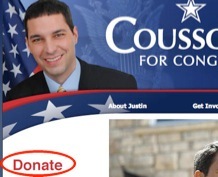 SCHULTZ: I say tonight that the DNC needs to filter money into Justin Coussoule‘s race to go after John Boehner. The Republicans have done a great job taking down leaders in the past like Tom Daschle. They got a lot of national money in South Dakota on that one. Thune beat him. I don‘t know why, we don‘t do the same thing on our side, we‘ll going to have you on again, Mr. Coussoule. Good luck to you. What‘s your website? COUSSOULE: Coussouleforcongress.com, Ed, or beatboehner.com, that will get you to us. SCHULTZ: Beatboehner, I like that one. Good to have you with us. CONWAY: Then we had a great internet fund-raising bomb yesterday that raised about $300,000. So, if your viewers want to help us, they can go to Conwayfightfunds.com and help us fight back some of this Karl Rove money. SCHULTZ: I know that we have restrictions on what we can do here at MSNBC. Over at Fox, across the street, it‘s a totally different story. Is this the way it‘s going to be, Eric? This conversation took place on October 15, immediately after Alan Grayson talked about raising money and gave out his website. Again. If it is inappropriate for a cable news channel to let politicos solicit money, volunteers, or whatever on its air, then it’s inappropriate for everyone, not just Fox. But have you heard anything from Media Matters, Think Progress, and the other ‘media watchdogs’ about MSNBC’s fund-raising? Where was Oliver Willis to deem this ‘a new low’? Instead of Eric Boehlert calling out MSNBC, he looks the other way while repeatedly going on their air! Today’s New York Times article makes on-air fund-raising look like something that only happens on Fox. Not one example from MSNBC is cited--not even Jack Conway’s open solicitation that replicates Kasich’s. But maybe the Times hasn’t gotten around to the Conway matter yet. After all, it only happened six weeks ago! Phil Griffin, we accepted your challenge and we met the test. Is there a prize? We’re not asking for anything big. How about this? You apologize, in the New York Times, for your false claim that MSNBC doesn’t allow fund-raising on its air. Do that, and we’ll call it even. David Zurawik: MSNBC crosses line on fund-raising--just like Fox. Inside Cable News: Boomerang PR. Hot Air: Yes MSNBC, there’s plenty of Dem fundraising on your network. Chris Golas: Johnny Dollar exposes MSNBC fund-raising. Liberty in Progress: J$ tries to paint all of MSNBC as fundraising for Democrats. TV Newser: Cable News Becomes a Factor in Political Fundraising. Newsbusters: Phil Griffin Laughably Claims MSNBC Doesn’t Fundraise for Dems. Mediaite: MSNBC Pres Asks for Examples of On Air Fundraising, Examples Found. Media Blog: MSNBC Issues a Challenge to Find Dem Fundraising on MSNBC.